Relationship Rescue in a Flash Archives - Joelle Delbourgo Associates, Inc.
A number of years ago, a therapist named Nancy Dreyfus contacted me about a book that she’d written that had gone out of print. 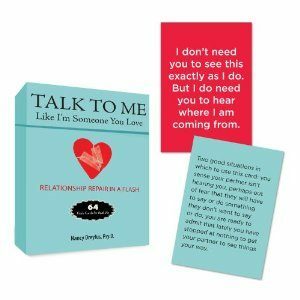 That book was TALK TO ME LIKE I’M SOMEONE YOU LOVE, a series of flash cards that provided words to bridge the communication gap that often exists between two people in a relationship. These words proved to be so powerful and affecting that I encouraged the author to expand the original concept and write an essay for each flash card, explaining why these words had power and how and when to use them. We sold the book to one of my favorite editors, Sara Carder, at Jeremy P. Tarcher, a division of Penguin. She brought the book out in an attractive edition and it did so well, that a few years later, Tarcher issued an expanded edition and a set of flash cards. The beauty about Dreyfus’ approach is that it can be used not only in romantic relationships and with long-standing couples, but also with close friends, siblings, parent and child, and so on. For Valentine’s Day, give yourself the gift of Dreyfus’ brilliant book and get closer to the one you love.